iOS 6.1 has been released to the public. 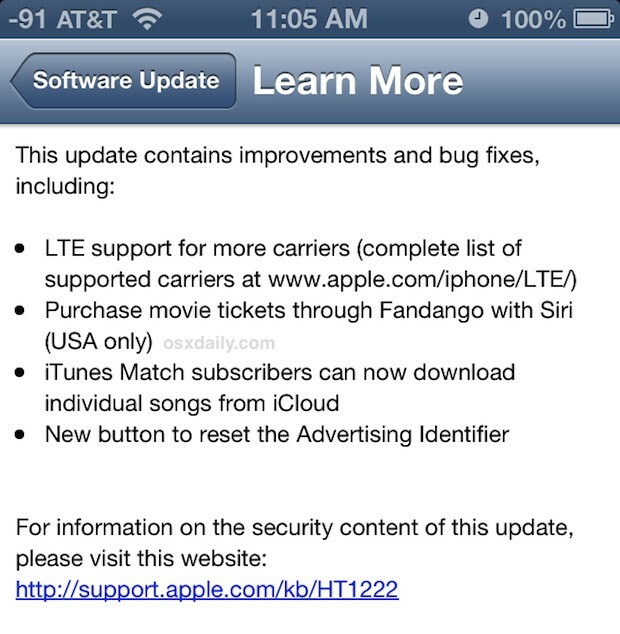 The update consists of bug fixes and improvements, including wider LTE support for more carriers, the ability to purchase movie tickets with Siri, a new feature that lets iTunes Match subscribers download individual songs from iCloud, and a new button to reset the unique Advertising Identifier for each device. The release notes can be read below. Devices that support iOS 6.1 are the same that were supported by beta versions, including iPad 2, iPad 3, iPad 4, iPad mini, iPhone 5, iPhone 4S, iPhone 4, iPhone 3GS, iPod touch 4th gen, and iPod touch 5th gen. There are a variety of ways to get iOS 6.1, including OTA updates, through iTunes, or the more advanced method of downloading IPSW files and performing a manual update. It’s always a good idea to back up any iOS device before installing a new update. Backups can be done manually with iCloud or with iTunes to your local computer. The iOS 6.1 update weighs in around 107MB when downloaded with Over-the-Air. Connecting any compatible device to iTunes should trigger the request for the 6.1 update and download. The following firmware files are hosted by Apple. Updating with firmware is considered more advanced and not necessary for most users, though it’s not particularly complicated and you can learn how to use them here. Right-click a link below and choose ‘Save As’ for best results. Apple also issued a press release to announce the availability of the 6.1 update. Post has been updated with all direct IPSW links. Right-click and save as, should have the file extension of .ipsw! What a dull iOS update. What’s the point? Maybe there’s some hidden bug fixes that are important they didn’t mention but man, what a letdown. Yes– Serious bug fixes! My iPod was crashing so much and so laggy, that I almost stopped using it altogether. 6.0.1 caused lots of problems until this update. There are some reported problems with updating the 5th gen iPod touch, stay tuned we’ll update as we hear more. does it change the baseband? Yes, but it is safe for the upcoming iOS 6.1 jailbreak. If you use an old baseband for unlocking not so much. I still dont understand this, they have this update for a iphone 3gs much older than the first ipad so why not make it for all Ipads including the first one I would love to have those features are they ever going to make it for the first ipad? 3GS has bigger sell. It’s obvious. when i try to update the firmware through itunes using the ipsw its telling me that its not compatible. i have an iphone 5. 1. Don’t use Over the air(OTA) update. Denell, check your iPhone 5 model. I had the same issue. Chances are you have A1429 which is the international version supporting GSM as well as CDMA. Even though you are using your phone on GSM, this phone uses the CDMA ipsw to update. So your solution is to download the CDMA version (iPhone 5,2) and it should work. Dang can’t upgrade need a minimum 998meg free wooza! How do you upgrade from 6.1 Beta 5 to this public release? You dont need to update! Its the exact same build! There is a banana on the floor. Please can someone shed some light on this? I have to tell you something amazing… There’s an update! Wich would change the world into a better place. One more thing… This update is going to change your life it’s soo hugh so good so big… it’s awesome… it’s homptiedom…. it’s victoria’s secret’s secret… it’s more amazing than ultimate awesomeness then giganess…. Get your facts f*cking straight Apple. I’m in The Netherlands all Android phones understand dutch except my iPhone. My iPhone doesn’t understand a word Dutch and you are buying tickets for movies… wow. Since Steve Jobs is gone something also left it’s called: PRIORITIES. Steve, you spelling has not improved. well,i think this is purely marketing strategy of apple..they released another update saying “bug fixes” yet they did not specify which bugs they fixed..
i think they should be more focused on users’ necessity about their units and not just all new features/updates..
Hello dear, may I request u to solve my problems. My device is JB iPad 2 with ios 5.1.1.Now I wanna to update ios 6.1 and I was restoring ios 6.1 with the latest itunes, the alert messages: error -1 was popping up. Now i can”t do anything and whenever my idevice is connected with itunes, it is in recovery state and ask to restore. Waiting for yr ans: Thank u so much! I have an iPad2 (iOS 5.1) which got corrupted while updating its software. I really got troubled to update and recover iOS 6.1 via iTunes it kept downloading a corrupted file, and to be on the safe side I also downloaded the latest iTune version but no luck at all. [3524:121c]: amai: tss_submit_job: STATUS=94&MESSAGE=This device isn’t eligible for the requested build. [3524:121c]: amai: kAMAuthInstallRequestCacheLocalizedTssError: cached server error text: (3194) This device isn’t eligible for the requested build. [3524:121c]: amai: AMAuthInstallRequestSendSync: failed tss submission: This device isn’t eligible for the requested build. [3524:121c]: amai: AMAuthInstallBundlePersonalizePartial: server request error: This device isn’t eligible for the requested build. [3524:121c]: failed to personalize the restore bundle: This device isn’t eligible for the requested build. After downloaded multiple software packages (ipsw), I finally got the package which matches my device iPad2 (newer model) – iPad2,4_6.1_10B141_Restore.ipsw. and then plugged in the iPad, clicked Restore iPad and instantly iTune start extracting the software package and successfully restored the updated iPad firmware within minutes. guys these files does not download into ipsw extension. Right-click and SAVE AS, or use a different web browser like Chrome. Change the extension from ‘.zip’ to ‘.ipsw’ … it’ll work definitely…. STOPS AFTER 487 mb… everytime X( WHAT THE HELL!! !